See-saws, narrow walkways and hurdles are basic components of agility courses. Agility courses pit handlers and hounds against a complex obstacle course designed to test the dog's stamina and dexterity. Agility contests range in size from local community-organized events to national tournaments. While the rules may change depending on the sponsor, regulations governing course and equipment surfaces are standardized. The running surface is the terrain that the dog and handler traverse to go progress through the course. Packed dirt, grass, carpeting and padded matting are the four surface types accepted at AKC-sponsored agility contests. Grass cushions the impact on the contestants' legs as they run and is the ideal surface for an outdoor competition, according to Elderwood Agility. All running surfaces must be no-slip in wet and dry conditions to ensure the safety of the dog and his handler. Ramps, tunnels and hurdles are just a few of the equipment obstacles that successful contenders must navigate as part of the agility trial. All equipment surfaces must allow dogs to keep traction in wet and dry days. Anti-slip slats are required on ramps and other equipment to give dogs something to grip, according to the World Agility Open Championships. Solid surfaces are ground with sandpaper, or "roughed," to increase friction between the contestants' paws and the equipment. Regardless of the surface type, event organizers also need to establish visible boundary lines to direct the handler during the run. Any tape is fine for indoor courses, but outdoor lines should be made with bright neon duct tape, according to the American Kennel Club. Organizer of club-sponsored tournaments must clearly mark start and finish boundaries. In AKC contests, organizers post a visual layout of the course at least 30 minutes before the runs begin. While you can research competitions and pick and choose the ones that use your preferred terrain, it's a good idea to get your dog accustomed to all the accepted turf types. 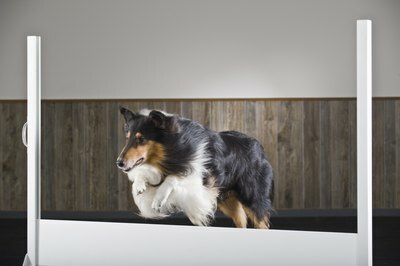 If you plan on participating in many agility competitions, your pup should be able to run courses confidently on any of the surface types. Be sure to train your companion in indoor and outdoor environments so he doesn't get thrown off by the unfamiliar when it matters most. Elderwood Agility: New to Agility? What Dogs Are Eligible for AKC Agility? Are Sunflowers Poisonous to Cats?